Configurations: 2WD Crew Cab 153.7", 2WD Crew Cab 167.7", 4WD Crew Cab 153.7", and 4WD Crew Cab 167.7"
includes (AG1) driver 10-way power seat adjuster when ordered with (AZ3) front 40/20/40 split-bench seat only, (BTV) Remote Vehicle Starter system, (T3U) front fog lamps, (C49) rear window defogger, (CJ2) dual-zone automatic climate control, (UG1) Universal Home Remote, (N37) manual tilt and telescoping steering wheel, (KI4) 110-volt power outlet, (CGN) spray-on bed liner and (RIA) all-weather floor liner, LPO. (When (TRW) provision for cab roof-mounted lamp or (VYU) Snow Plow Prep Package are ordered, (UG1) Universal Home Remote will not be included. 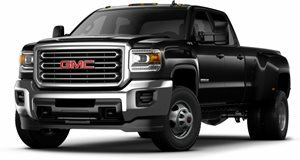 Not available with (PDO) Protection Package, LPO, (PCM) SLE Preferred Package, (PDL) Cargo Convenience Package, LPO, (BG9) graphite-colored rubberized-vinyl floor covering, (ZW9) pickup box delete or (L5P) Duramax 6.6L Turbo-Diesel V8 engine. No changes or substitutions to the included HD SLE Preferred Plus Package equipment will be allowed unless noted above.) HD SLE Preferred Plus Package Includes: Driver 10-way power seat adjuster when ordered with front 40/20/40 split-bench seat only Remote Vehicle Starter system Front fog lamps Rear window defogger Dual-zone automatic climate control Universal Home Remote manual tilt and telescoping steering wheel 110-volt power outlet Outside heated power-adjustable trailering mirrors Spray-on bedliner All-weather floor liner When provision for cab roof-mounted lamp or Snow Plow Prep Package are ordered, Universal Home Remote will not be included. includes (AG1) driver 10-way power seat adjuster when ordered with (AZ3) front 40/20/40 split-bench seat, (T3U) front fog lamps, (C49) rear-window defogger, (KI4) 110-volt power outlet and (CJ2) dual-zone climate control.